I know you’re probably craving popsicles & slushies right now, plus…Passover ended like, two months ago. But here’s the thing: I had two extra unopened boxes of matzah left over from that Family Fun Size package we got back in April, and I recently needed to quickly whip up a dessert for a gathering with friends. I decided to quit staring at the boxes and put them to use. Dessert is my favorite thing to bake. I started baking at age three, serving as my Mom’s resident cookie-assistant-in chief…which mainly consisted of pouring in the chocolate chips, pretending to stir the batter, and licking the bowl. 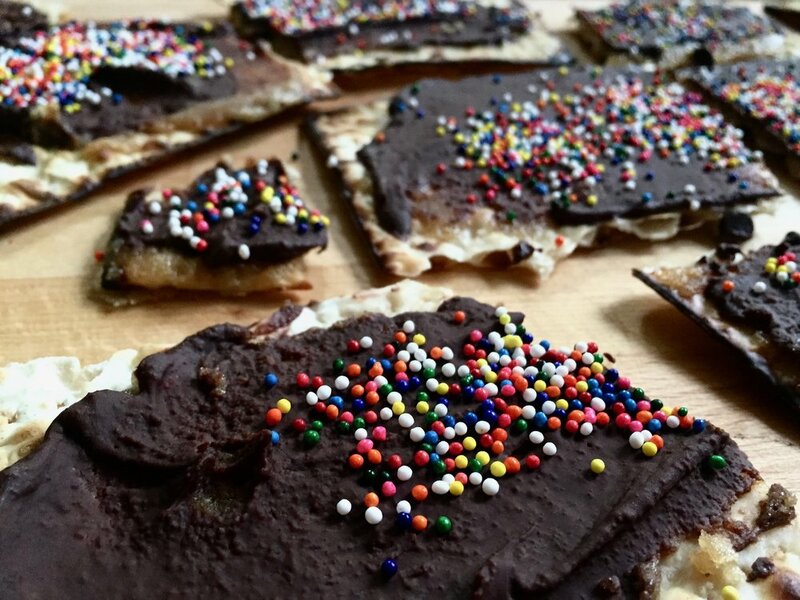 I have a slew of go-to dessert recipes, but the chocolate covered matzah is certainly on the top of the top. It’s not only a crowd pleaser; simply put... it is the best. Yep, not even betterish…it’s the best. For nearly twenty years, this recipe has been highly acclaimed by friends & family near and far. It started as my Mom’s recipe, and I have since altered it to make it my own. After I graduated high school, word has it my Mom would actually deliver gallon size bags of chocolate covered matzah to my friends’ houses. I think she even mailed it to a few of close friends who also went away to college that year. She definitely sent some to the theatre I used to work for in Baltimore. I have some of the funniest memories of studying for mid-terms in college, completely delirious, and sharing chocolate covered matzah among my friends in the library. My last year living in Baltimore, I decided it was time for me to finally learn the recipe myself. Since then, every Passover season, I’ve gone on some serious chocolate covered matzah making escapades, and have shared widely with friends and colleagues in Oregon, Santa Cruz and now most recently in Denver. 1.) Truly: you don’t have to save this recipe for Passover time. Turns out it tastes great in June, too. Probably even better come November. 2.) If you can’t find matzah in the grocery store, saltine crackers make a great substitute. 3.) Make the best of what’s around in your kitchen. Sometimes I get really set on making something, but then realize I don’t have the majority of the ingredients…but totally have the majority of ingredients to make something else. This was the case in my most recent chocolate covered matzah bake. 1.) Preheat oven at 350. 2.) Line a cookie sheet with tin foil and lay matzah on pan (break it up). 3.) Melt brown sugar with butter in saucepan; boil until mixture coats a spoon (I’ve even used a clean paint brush). 4.) Brush matzah with brown sugar mixture (I keep making this mixture thicker and thicker each year ) + a handful of chocolate chips on each piece of matzah. If topping with marshmallows, now’s the time to add the big fat marshmallow on top of each piece of matzah. 5.) Bake in 350 degree oven for 4-5 minutes (keep an eye on it) until the caramalized layer starts to bubble. 6.) Remove from oven. Spread that chocolate to cover the entire piece of matzah. The marshmallow part will get messy! Just spread with melted chocolate, mix it all together. 7.) If using other toppings such as sprinkles or almonds, now’s the time to pour those on. 8.) Put in freezer until hard, then break into smaller pieces. Store in ziplock gallon bags.